This Beet Tart with Goat Cheese and Hazelnuts was inspired by some farm fresh produce I got this month. I’m holding on as long as I can to my beloved CSA share! 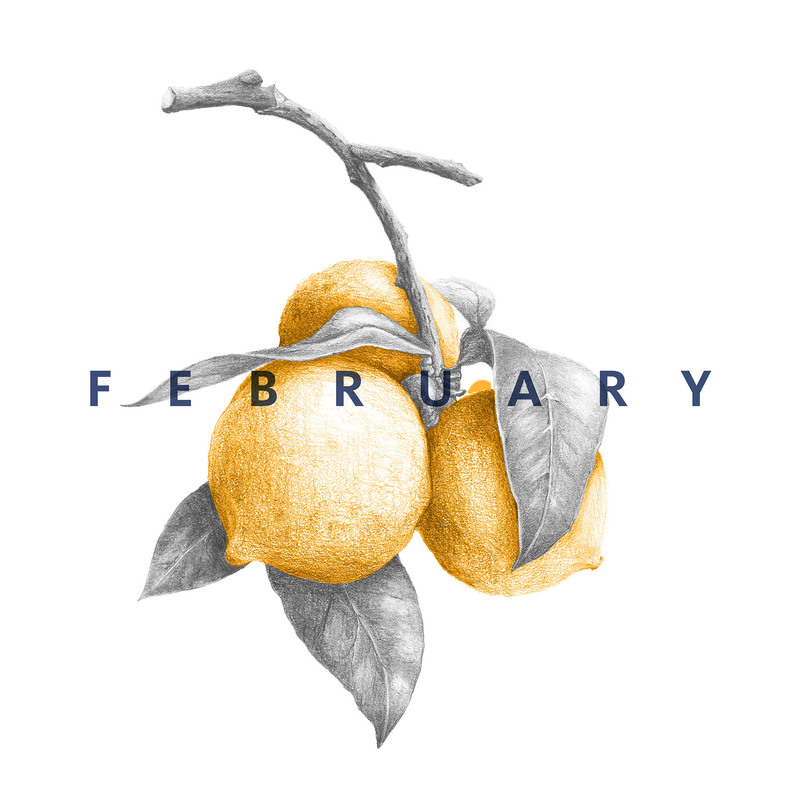 CSA stands for Community Supported Agriculture and is a way for us city folks to enjoy the fruits of local farms. At our local CSA, La Nay Ferme, you ‘buy in’ by purchasing a share for the season and then you get a harvest bag of their freshest produce weekly or bi weekly. This was my first year to enjoy a full share all summer long and even this far into the fall too! I just keep telling myself, why are we just now doing this?? Our latest harvest bags have included carrots with seemingly impossible colors, both green and purple bell peppers, bright red beets with perfectly intact green leaves, and plenty of herbs and greens. The beets along with their beautiful red stems and green leaves were too stunning to ignore. I wanted to make something with them that was equally as beautiful as they were naturally and I knew I had to use every bit of their plant. I first sautéed the stems with a shallot and some oil then added in their greens, roughly chopped and sautéed them until they wilted. This became a little green bed for the beets and goat cheese to rest on in the tart. A generous amount of goat cheese was layered on after the greens, then some chopped fresh thyme and the roasted and sliced beets. The savory tart was then topped with sea salt and baked. Three fourths of the way through baking I added the chopped hazelnuts to roast and then when the tart was fully cooked I drizzled honey on top before slicing it and serving it. 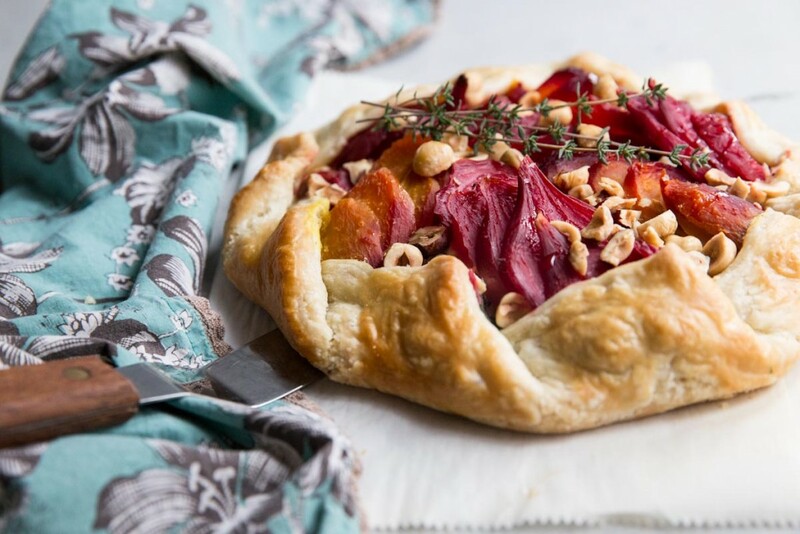 Now I knew I would love this tart… sautéed greens + goat cheese + roasted beets + hazelnuts AND flaky pie crust… so many of my favorite things but I also knew this might be a little bit of a stretch for the other two in my family. So, you can imagine my surprise when my husband and my son asked for seconds!! A win all around! 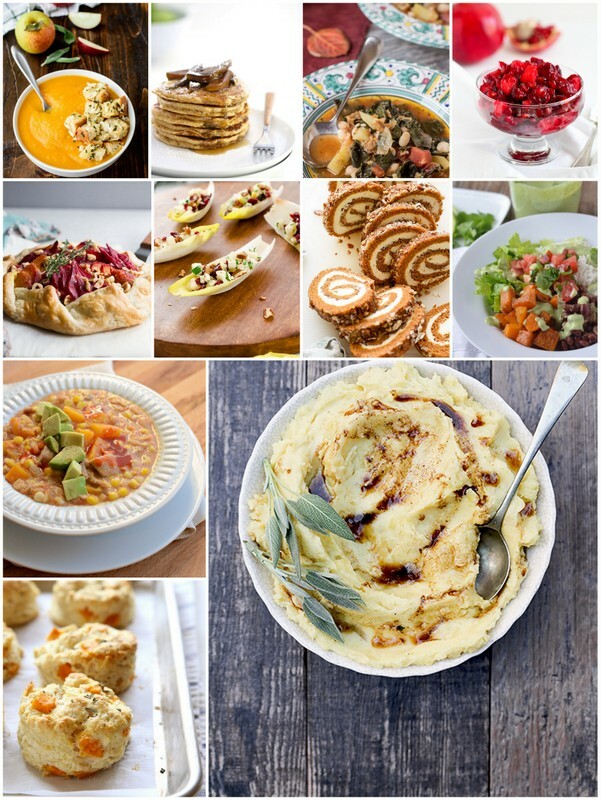 For a full list of seasonal produce, check out my Seasonal Produce Guide for November. A beautiful way to use up a bouquet of beets. 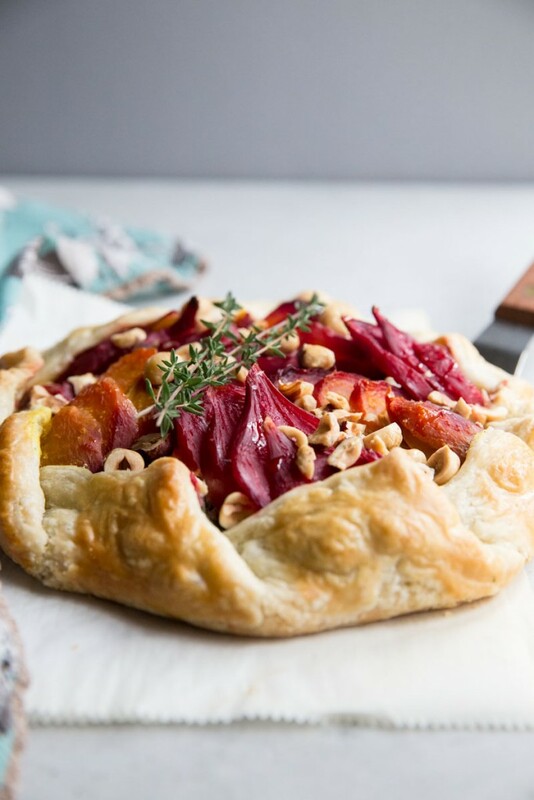 This galette uses everything from the stems and leaves to the beet roots. Preheat oven to 400 degrees.Remove stems and leaves from beets and set aside. Rinse each beet to remove any dirt and pat dry with a towel. Wrap each beet individually with foil. Place all beets on a rimmed baking sheet and bake for 1 hour (might be a little less for smaller beets). Let cool then the skin should easily peel off. Slice the beets and set aside. As the beets are roasting, slice the beet stems into 1/2 inch pieces and roughly chop the greens, keeping the two separate. Saute the shallot in olive oil for 1 minute then add in the beet stems. Once stems are tender (5 minutes or so) add in the leaves and stir with a wooden spoon to wilt. Add 1/2 teaspoon of sea salt to the greens. Set all of this aside to cool. Prepare a larger baking sheet with parchment and preheat the oven to 375 degrees. On a well floured surface, roll out the pie crust to about a 9 inch diameter. Use flour as needed so that the crust doesn't stick to the surface. Transfer the pie crust to the parchment paper to build the galette. First layer beet stems and greens then add spoonfuls of goat cheese. Sprinkle the thyme over the cheese then arrange the sliced beets. Sprinkle the beets with a little extra sea salt then add the chopped hazelnuts. Place the galette in the oven for 40-50 minutes at 375 or until the crust is golden brown. Drizzle with honey and serve warm. Gorgeous, Becky! The colors in this tart are absolute fall perfection. Thanks so much Sarah 🙂 Fall is definitely my favorite! This is so beautiful, Becky! The presentation and the way you’ve laid out the sliced beets is just stunning. Great way to make use of all the goodness from your CSA. XO! I’m obsessed with my CSA!! But you have a family farm so I’m sure you are way spoiled to the best veggies out there! 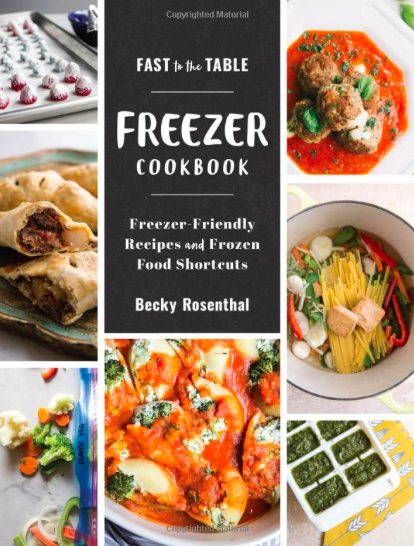 Your CSA share sounds incredible, Becky — I would look forward to that every week or 2! 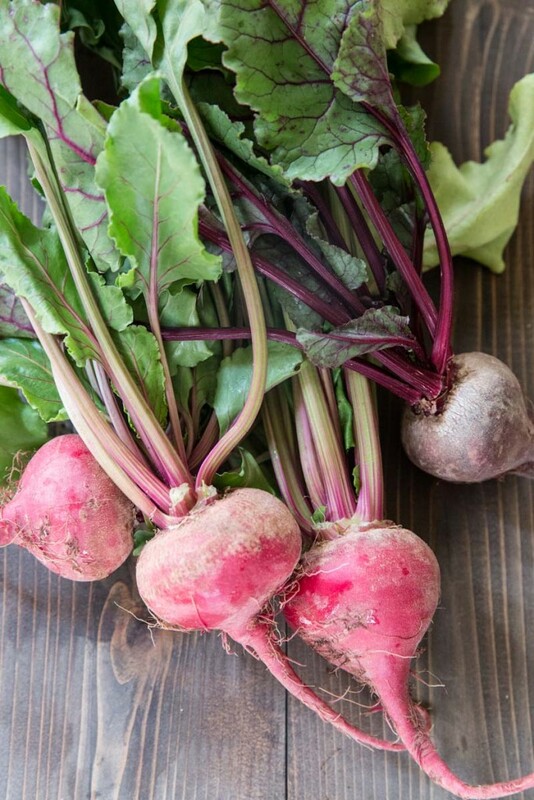 You put these beets to great use here, and I love that you used the greens, too. 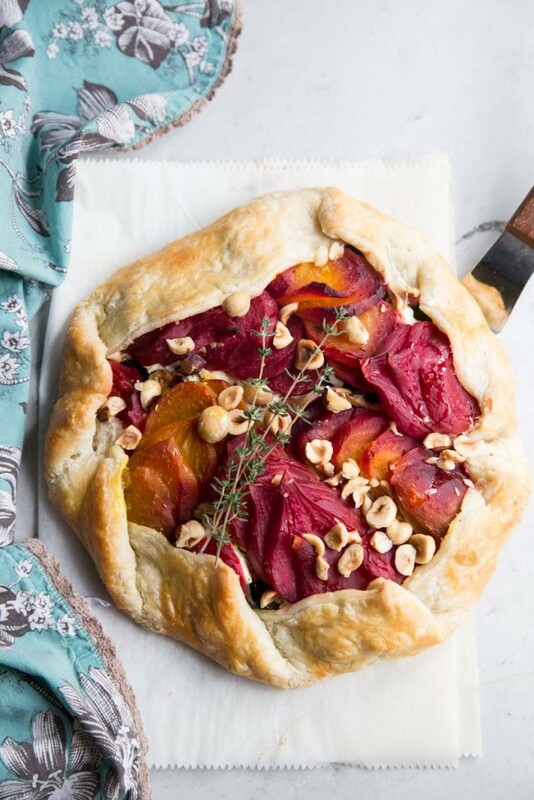 This galette is so rustic and gorgeous, and the combination of flavors sounds incredible! Thanks so much Marcie. 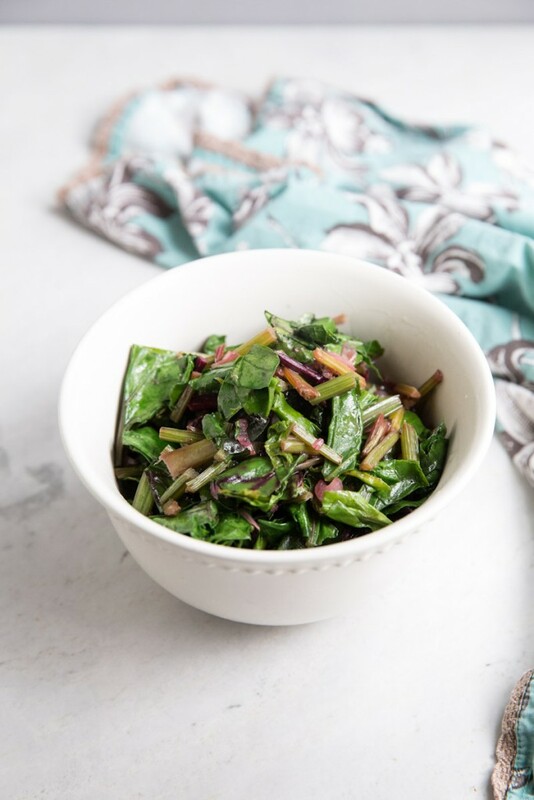 I surprised myself at how much I even liked the beet greens! 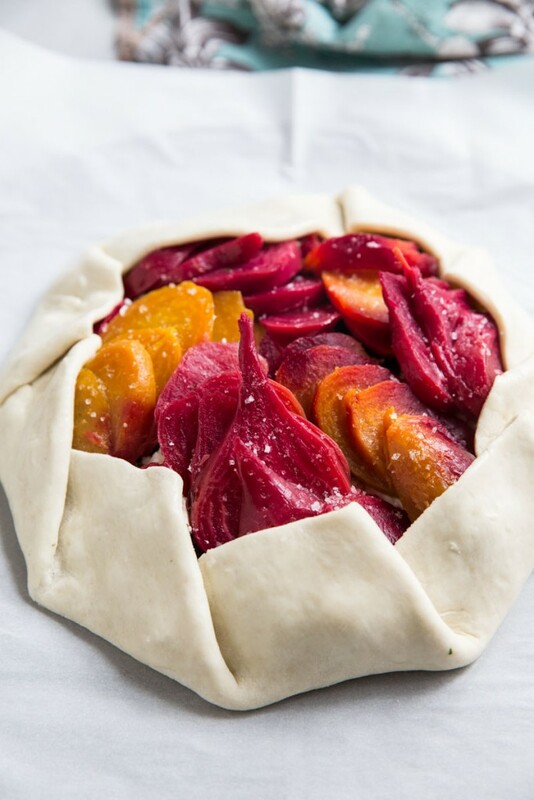 Beets and pie crust… only good things can come from this combo! Seriously, why do beets have such a bad wrap, they are my favorite! Nothing like a box of CSA veggies to inspire blog posts. 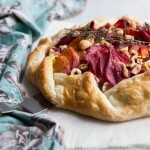 I adore your galette presentation of beets and that you include the greens as well. All of my favorite things in one gorgeous tart. Love this Becky! Wish you were here to have a slice with me!